Rustenberg has been producing South African wines since 1682 – a long and rich tradition. 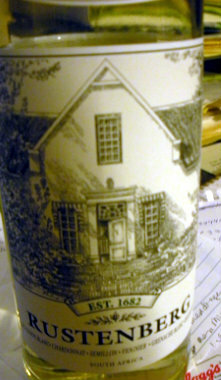 By 1781, the winery made 3,000 cases. The estate was purchased in 1941 by Pamela and Peter Barlow and has remained in the family ever since. This 2013 Sauvignon Blanc offers freshness, acidity and balance with upfront fruit. The wine offers hints of green pepper, gooseberry and even asparagus. The altitude and location next to Simonsberg Mountain combine with a west facing slope. The grapes are full flavored and tropical in style. No oak is used in the production of the wine. Spring of 2013 brought later ripening and a cool growing season. The wine is medium bodied, elegant and crisp with 13.56 ABV. There are underlying notes of passion fruit and pineapple. This is a perfect wine for a hot summer day, alone or accompanying a meal. It is imported by Indigo Wine Group, Venice, Fl. Visit www.rustenberg.co.za. This entry was posted in Uncategorized and tagged Indigo Wine Company, Rustenberg, Sauvignon Blanc, South African wines, Stellenbosch on August 8, 2015 by Susan Holaday/Foodservice East Online. This entry was posted in Uncategorized and tagged Cape, Indigo Wine Group, Rustenberg, South African wines, Stellenbosch on April 12, 2013 by Susan Holaday/Foodservice East Online. Thelema Mountain Vineyards in Stellenbosch, South Africa, is located on the slopes of Simonsburg Mountain and is a great example of the growing excellence of South African winemaking. Family run since 1988, it produces this rich, plummy Cabernet Sauvignon with mint nuances, mocha, dark chocolate and boysenberry fruit. The mint is believed to come from oils from eucalyptus trees, which ring the vineyard. 2009 was a an excellent year with warm, dry conditions for ripening. The wine received five consecutive 90+ ratings from Wine Spectator. Gyles Web, proprietor and cellarmaster, is a former accountant, now focused on high quality, small production wines that have won well-deserved acclaim. 14.5 percent alcohol, this Cabernet delivers intensity and freshness. Visit http://www.CapeClassics.com. This entry was posted in Uncategorized and tagged Cabernet Sauvignon, South African wines, Stellenbosch, Thelema Mountain Vineyards on March 30, 2013 by Susan Holaday/Foodservice East Online. From high above sea level in the cooler areas of the Western Cape, the Cape of Good Hope in South Africa comes this charmer of a rosé from trellised vineyards where the owners pipe in Baroque music because they believe it will impact the ripening process of the grapes in a positive way. The grapes are handpicked, de-stemmed and lightly crushed and the juice is left in contact with the stems for nearly tree hours, allowing a pink hue to develop. The must is settled overnight and cool fermented to maintain a fresh fruit profile. On the lees for some four months, the wine’s “best components” are chosen and blended, then filtered prior to bottling. In tribute to the Cape’s Dutch roots, the vineyard’s name, DeMorgenstern, means “the morning sun” in Dutch. The first vines were planted in the early 1700s and the estate was sold in 2003 to Wendy and Hylton Applebaum who have transformed it in recent years. This entry was posted in Uncategorized and tagged DeMorgenstern, Rosés, South African wines, Stellenbosch on March 15, 2013 by Susan Holaday/Foodservice East Online.